This young man who is light years away from 30 has launched a successful brand in a few short years. It is encouraging to see many emerging as well as successful Asian designers, namely Phillip Lim (my favorite), Derek Lam, Peter Som and Vera Wang. 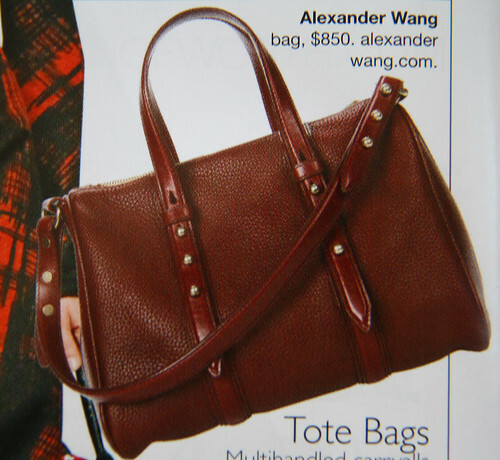 Alexander Wang designed an IT bag which has a cult following. It was a simple speedy bag with studs covering the base. I can't say I was in love with it but I fell like a ton of bricks when I saw his latest offering on the latest US Vogue issue. Please excuse the poor quality of the photo. My scanner is utterly useless so I photographed it instead which didn't do the trick either. The simplicity of the design was pure genius. I love the fact that the handles and strap are adjustable. I like having options which means at times, I prefer to carry my bag on my shoulder and if I need to be hands-free, I'll loop it across my body. Since I'm rather vertically challenged, the strap is usually way too long. I don't have skinny arms so it's a bit of a tight squeeze at times with handles that are too short. I can't wait to see it at a store in the UK. Given that it's USD $850, it's very affordable compared to the exorbitant prices that designers charge for their bags these days.